With the vast expanses of Eastern Europe and beyond, cavalry had remained an important element in the Russian Army in the early 20th century, and that remained so after the revolution of October 1917 saw the creation of the Worker’s and Peasant’s Red Army, or RKKA; soon known more simply as the Red Army. Despite the egalitarian principles of the revolution the cavalry soon emerged as something of an elite, whose exploits were praised loudly by the propaganda machine, and above all the First Cavalry Army under its inspiring leader Semion Budenny achieved great fame during the terrible years of civil war that followed. In the early days of the Red Army the chaos of the revolution and the existing supply difficulties meant the early troops turned out in a mixture of old Tsarist uniforms (suitably stripped of insignia) and civilian dress, and this look lasted for some time. The first new item of uniform to be issued was the soft pointed cap known as the Budenovka, but this was essentially a winter item, with its warm ear flaps, and the peaked cap remained the usual summer wear. Some of the troops here have the Budenovka and some the peaked cap, while others wear an assortment of fur caps, but all these are very suitable for these men. The men wear a variety of tunics and short coats, including the very Russian gymnasterka, some having the revolutionary razgovory tabs across the chest, so again everything here is authentic. Finally everyone here has managed to acquire long riding boots, which may not have been quite as universal as this suggests but again is not wrong, so no problems with accuracy. The horses are the same as have been seen in several previous sets of Strelets World War One Russian cavalry. Each animal is quite heavily kitted with saddle bags, blankets and the like, and again while the reality was generally more varied than this nothing here is actually out of place. The poses however are a very mixed bunch, with many being very poor and far from natural for any horse. Five of the six poses seem to be at full gallop, so whatever the rider may be doing, the horse is taking part in a charge. Fully half of the human poses have sword drawn and so would seem to be in or approaching combat. Most of these swordsmen are pretty flat, with the sword always held directly over the mid-line of the body. The one exception is the second figure in the top row, who has a separate sword fitting into his ring hand. Poses like the last one in that row turn up often, yet why exactly would anyone hold their sword out from the hip like that? The three men using their rifles all give the impression of not being in a charge, so look rather incongruous on the charging horses supplied. That aside two are perfectly good, but the man who has raised his rifle to his shoulder is looking straight ahead, not where he is pointing his weapon, so a very poor pose. The men with the bugle and the flag are standard but useful poses, as is the officer who holds his pistol aloft. Finally the dismounted officer saluting is an interesting and unusual addition to the selection, but well worth having. It has even been suggested that this figure could be used to portray Semyon Budyonny himself. Apart from the three men holding their rifles, all but the officer have theirs slung across their back. It is hard to be sure but these could easily be the common Mosin-Nagant M1891, so are fine. The swords have a slight curve to the blade, a minimal hard guard and no knuckle guard, so look to be of the Cossack or dragoon style such as the shashka 1881 model - again good. Lastly the officer seems to hold the popular Mauser K-96 pistol. The sculpting is quite reasonable, with fair detail, although the subject does not call for high levels of detail in most areas. However some areas like the razgovory tabs on the tunics are quite basic and do not reflect the ornate shape of the real thing. Also, while every man has his feet in a stirrup, that stirrup does not have a strap attaching it to the saddle, so everyone has their feet effectively hanging in the air. Similarly, the officer has a bag on his left hip clearly attached to a strap that runs along his back and over his right shoulder. It then goes down his front to the jacket opening, then seems to disappear inside the jacket, which looks very strange. Some of the caps have a clearly visible (red) star, and one of the caps has a diagonal (red) stripe, another Red Army distinction. The men have good proportions, but the horses, coming as they do from an older, more chunky tradition, are much less appealing. The flag, which was commonly carried and of various sizes, is here unengraved but fairly flat. More to the point, it is being blown very strongly from the right side, even if the man is moving forward rapidly on his charging horse. The separate sword fits the ring hand well, and the riders fit their mounts particularly well, even gripping slightly so they stay put without need for bonding. There is very little flash, so these are nicely presented figures. So not a lot to complain about here, and some pretty useful figures. However we must comment on one word in the set title, which is ‘summer’. As we have said, the Budenovka was a winter item, and while summer versions did exist most did not have the long side flaps for obvious reasons. 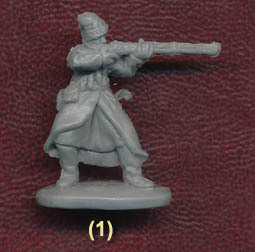 Also several of the men have nice warm astrakhan caps, and the dismounted officer wears a long double-breasted coat. So most here look to be quite well wrapped up against the cold, and while they do not wear the greatcoats of the Orion Red First Cavalry set, they don’t give the appearance of operating on a warm day. Perhaps where they are currently campaigning they are not enjoying much of a summer!